A Special, unprecedented study of Acts 1:9-11! There are two scriptural texts that I feel are keys to a proper answer to the question of whether or not Jesus is coming back in our present day future: Acts 1:9-11 and Matthew 24:1-34. In this article I’d like to examine Acts 1:9-11. Regarding Acts 1:11, Keith Mathison states, “The Greek word translated ‘will come’ is eleusetai, which is the future indicative form of the verb erchomai.” So let’s begin by affirming that the translation “will come” is correct. There is little room for debate regarding the word “eleusetai” involving the future here. That being said, we must examine two important aspects of the context of this claimed future coming revelation: first, who is being told that a future coming is going to occur; and second, what situation are they in when they receive this revelation? That is, what was the audience doing, and why, when they received this revelation? I believe this context is vitally important to understanding these verses. Without this contextual information, we simply have the revelation of a future coming being given to a group of people that could have been doing anything for any reason. But that is clearly not the case here, for we have a group of people doing something specific and for a specific reason. We have people looking toward the sky above them after a person who is very close to them suddenly vanishes into a cloud. This must have been very shocking to witness, thus it is no wonder that they would have been staring into the sky where Jesus had just vanished into a cloud. To those who witnessed the ascension, it was certainly a very dramatic and personal event, one which must have left a very powerful and personal impression upon their minds and eyes. This was an experience that they were feeling very strongly and were intimately involved with personally. That moment of awe, which most certainly entailed some sadness, was at the forefront of their thoughts at the time. The ascension consumed them at the time. So what happens during this all consuming moment? Two men dressed in white speak to them. We do not know who they were, angels or otherwise, but suffice it to say that the disciples would have surely perceived them to have been sent by God. And what do these two men in white say? They ask the people, who were consumed with staring into the sky where Jesus had vanished into a cloud, why they were doing what they were doing. The two men in white were addressing what the people were doing. In addition to the timing of Jesus’ coming being important, one must also determine the nature of His coming. This is critical, since Scripture speaks of the “coming” of the Lord in a non-bodily, non-physical form. Isaiah 64:3 states “When you did awesome things that we did not look for, you came down, the mountains quaked at your presence.” This judgment of God upon Israel is a past event, yet there is no evidence for a bodily, physical manifestation of God. Acts 1:11 makes a proclamation and affirmation that summarizes the “manifestation and presentation” of Jesus during His earthly ministry and ascension. The words “This Jesus” represent the form of His “presence,” which was bodily and physical, and the words “who was taken up from you into heaven” represent the “method” of His leaving the Earth, namely, in a cloud. Verse 11 thus sets up the perfect model and example for this future coming of Jesus to be in a bodily physical form and coming out of a cloud―if that is what the two men in white had in mind. As noted previously, verse 11 uses the Greek word “eleusetai,” which is translated “will come.” Being supplied the words “will come,” if one has in mind a coming that was to be in a bodily physical form and coming out of a cloud, it would be very easy, apparent, and logical to add the word “back” to the words “will come.” This seems logical since we have an affirmation of Jesus’ bodily physical form going into a cloud. The word “back” would act as a “bridge” to connect and link together the ascension and future coming, both of which are in bodily physical form, and using a cloud as a means of transportation. This would make Acts 1:11 claim that Jesus would “come back” in a manner that is a reversal of the events of His leaving, a “reverse play-back of the movie” so to speak. However, the Greek word for “back” is not in the original text (it is incorrectly added in the NIV translation). Therefore, what is so easily and naturally affirmed by the word “back,” is quickly denied by its absence in the original Greek text. Furthermore, it must be noted that the words “will come back” would not necessarily have to refer to both Jesus’ bodily physical form and the way that form is manifested, namely, returning from in a cloud. It possibly could only refer to His bodily physical form, leaving open the way that form is manifested. However, the way that form would be manifested is specifically and immediately referred to as involving a cloud. Therefore, we have a deliberate and clear “denial” of the most perfect opportunity possible of proclaiming and affirming a coming in bodily physical form. This is because the potential of a bodily, physical form coming back on a cloud is destroyed by the lack of the word “back” coming after “will come.” We have a perfect opportunity presented to the reader, and it is then not realized, the result of which is a future coming that is not in a bodily physical form. Additionally, it is the mode and manner that Jesus’ physical body left—in a cloud—that is the focus and referent to His return in verse 11, not the bodily physical form itself. Therefore, the only reference to a return of Jesus’ bodily, physical form is an inference from the word “back,” which is not found in the original Greek. Also important is the fact that v. 11 does not simply reference or speak directly of a cloud. Rather, the disciples are told that Jesus would come “in the same way” that He was seen leaving. The phrase “in the same way” is translated from the Greek “hon tropon.” Both the KJV and ASV translate this more literally as “in like manner.” If the two men in white had in mind a physical cloud in the sky above Earth, then it would have been extremely enigmatic for them to refer to the “manner” of a cloud instead of simply referencing the cloud itself, since there was an actual cloud present during Jesus’ departure. One must keep in mind here an extremely important concept, namely, that a manner of something is not the same as that something. There is only one logical reason why the two men in white did not speak directly of a physical “cloud” when describing the coming of Jesus—were they to reference a physical “cloud” in their explanation, it would cause their listeners to immediately and inevitably think of a physical cloud in the sky from which Jesus was to come. The two men in white, instead of directly referencing a physical cloud, must have spoken of the “manner” of a cloud to prevent this misunderstanding by the disciples. This speaking of a “manner” of a cloud acts as a “polarizer” to differentiate between the real and very obvious “physical” aspects of Jesus’ ascension just witnessed, and the nonphysical “aspects” of His return. The subject matter of the Jesus’ coming involved a cloud without it being an actual physical cloud in the sky above Earth. Be sure to get a copy of Don K. Preston’s study of Acts 1 and In Like Manner for an in-depth, unprecedented, examination of this great text! Fifteen DVD lessons on In Like Manner! 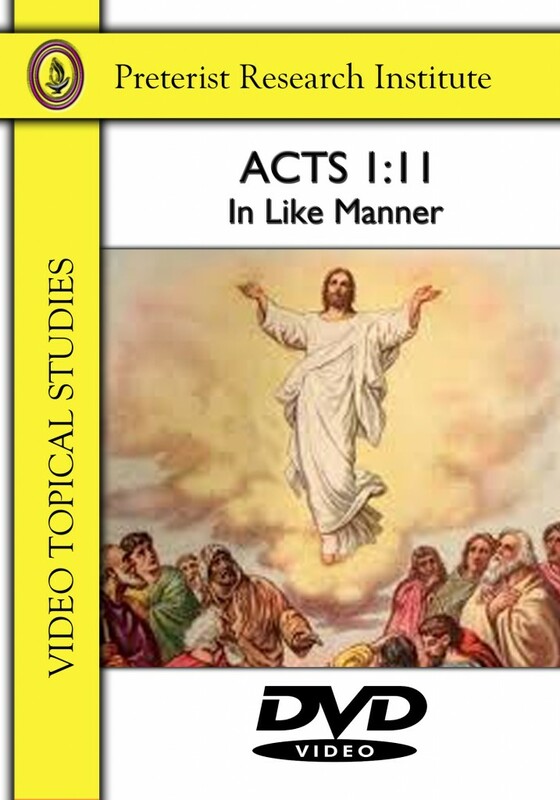 This is the most comprehensive study of “in like manner” and Acts 1 to be found anywhere! After one properly concludes that the future coming being referred to here was to occur in the lifespan of those present, and that it is neither a bodily physical form nor from an actual physical cloud, it is fairly easy to figure out to what this future coming is referring. It is referring to a “coming on the clouds” judgment coming as often seen in the Old Testament. Jesus ascended into a cloud, and he was to return in a judgment cloud. Jesus did this during the years leading to and including the destruction of the temple in AD 70. In like manner did not refer to the coming again of a 5′ 5″ Jewish man!